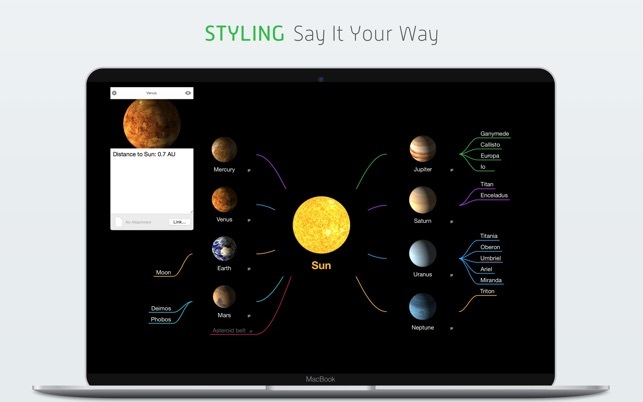 Create mind maps with the tap of your finger on your iPad and iPhone. Browse them on your Apple Watch and automatically share them between all your devices using iCloud Drive. MindNode for iOS is available on the App Store. If you have any feedback or questions, we'd love to hear from you! IdeasOnCanvas offers free support. You can reach us by email at support@ideasoncanvas.com, or on twitter at @mindnode. You can also read our User Guides or browse our FAQs on http://mindnode.com/support. 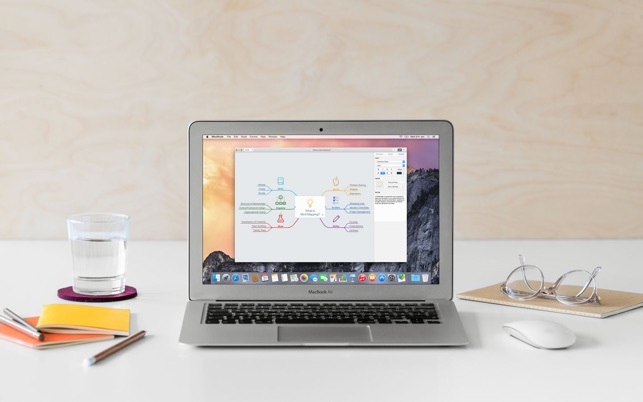 This update fixes two issues when using MindNode 2 on macOS Mojave. For full macOS Mojave support – including Dark Mode – please upgrade to MindNode 5. I really love this app. I use it constantly whenever I get stuck writing something in my Markdown editor. 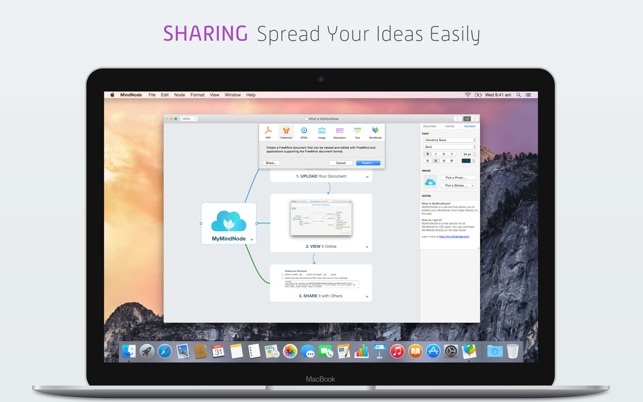 “It just works” is used to describe a lot of apps nowadays, but it is 100% true with MindNode. Whenever I try to do something, use some kind of stray command or gestures, what I want to happens, happens. Whenever I run into a problem with some other app, I often think “why can’t they just do what MindNode does? !” In fact, I started using MindNode as a kind of intermediate when I want to export something to or from Markdown, simply because MindNode does such a good job of importing/exporting things. That’s just one example, but you get the point: it just works. Someone please give this developer a lot of money so that they can go on and also build the best outlining tool! Beautiful app. A pleasure to use. Until you lose your work. I use MindNode across several devices. Today, I made big updates to a mindmap using my iPad. When I opened my Macbook, the same document was open on that device, and I got an error. To be cautious, I saved a duplicate copy. Now, on my iPad, I can see in the thumbnail that one version is the most recent, but when I open it, it opens to the first version. So frustrating that I can almost make out the work I put in when viewing the thumbnail, but when I tap — it’s not there. I haven’t experienced this kind of unreliable behavior and data loss from an app using cloud services in years. I guess I need to think twice before committing things to Mindnode — or make sure the application is only open on one device at a time? What year is this? Please make syncing reliable. Would you mind emailing us at support@ideasoncanvas.com so we can troubleshoot this? Possibly even with the file attached. I have used mindmapping for a long time and when I came across MindNode I was immediately sold. Very fast, intuitive, and “macOs” feel to it. I would love to see the ability to bring in some new features I used to have in MindManager (like workflow icons, etc.) but then this product is a fraction of the price and really does do what it says on the tin. Looking forward to version 5 to see where things are going but great job so far! BTW, to reviews that talk about crashing. I’ve NEVER had it crash in years of use.